“I am sorry that you object so violently to this parade, and that you feared for the safety of your relatives because such an event could take place in San Francisco,” wrote Moscone. The correspondence is just one illustration of how close Moscone was, both politically and socially, to the local LGBT community during his time in office. It is among the roughly 160,000 documents that make up the George Moscone Collection housed at the University of the Pacific Library’s Holt-Atherton Special Collections. His family agreed to donate Moscone’s papers to his alma mater in 2014. After receiving a $47,232 grant last year from the National Archives’ National Historical Publications and Records Commission, the university was able to process the archival material and digitize a portion of the documents so they are accessible online to researchers, students, and anyone interested in learning more about Moscone. He was sworn in as San Francisco’s 37th mayor in January 1976. One of his first moves as mayor was to appoint gay rights activist Harvey Milk to the city’s Permit Appeals Board. It marked the first time an LGBT person had been given a mayoral appointment to a major oversight body. In November 1977, Milk won a supervisor seat, marking the first time an out LGBT candidate had won elective office in both San Francisco and the state of California. The following April, Moscone and Milk, in conjunction with then-supervisors Carol Ruth Silver and Bob Gonzales, enacted the most sweeping gay rights protections of any city in the country. Known as the Human Rights Ordinance, it banned discrimination based on sexual orientation in employment, housing, and public accommodations in the private sector. Dated July 1, 1977, Moscone noted that, “In San Francisco we have tried to set a dignified example for the rest of the nation. We have tried to show the rest of the world that people can live together in peace, free from hostility and prejudice. That will continue to be our highest priority in this city, and I hope our nation as well. Several documents in the archive illustrate Moscone’s opposition to the ballot measure. One is the statement he issued May 9, 1978 asking the public not to sign the petitions in support of placing it on the ballot. “Harvey knew how I felt about it, before all of this,” Moscone told the Bay Area Reporter in an article published March 18, 1976. “We certainly haven’t had our share considering we voted for him,” Milk told the reporter from the San Mateo-based paper. 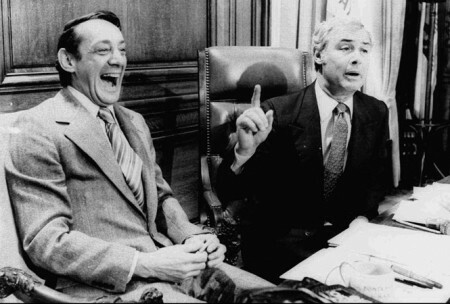 Tragically, Moscone’s term as mayor was cut short on the morning of November 27, 1978. Disgruntled former supervisor Dan White had snuck into City Hall with a gun and fatally shot both the mayor and Milk. The George Moscone Collection is open to the public by appointment or documents in the archive can be accessed online. Matthew S. Bajko is an assistant editor at the Bay Area Reporter. This article is published as part of the LGBT History Project.